Have you ever had one of those tough weeks that you were unsure that you’d be able to see you’re way through it? I have had one of those weeks before…and after that one…and after that one…and after…I think you get the message. You feel like you’re stuck between a rock and a hard place. Well, let me tell you something: everyone gets stuck between a rock and hard place at times. The difference between people who get stuck between rocks and hard places is how they get themselves out or if they get so stuck that there is no hope of getting out. I’ve been there before–stuck where it seemed that there was no hope. I called a friend of mine and asked if they could help me out from between the rock and the hard place. He said that he didn’t have the time. I called another friend and he said that he didn’t know what to tell me. Yet, with another friend of mine he tried to give me his opinion of why I ended up between the rock and the hard place and then he simply chastised me for getting myself in that position. I had no hope and no help. 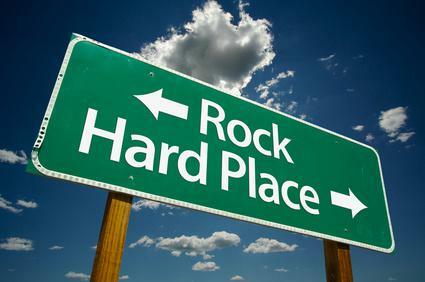 Are you stuck between a rock and hard place? Turn to Jesus Christ and you’ll find that you are truly a conqueror through Him because He loves you! For this and other Plexus products, visit www.shopmyplexus.com/dennygorena. I love you, my sweet Brother!